Please note that the Block of the Quarter will be drawn at the away meeting in Batemans Bay on Saturday 5 April. You can participate in the Block of the Quarter by bringing your TWO blocks along to the meeting or posting them into the Guild office by no later than Tuesday, 2 April 2008. Coming up this week are two illustrated talks at the Powerhouse Museum on Sunday 30 March and on Wednesday 2 April (free with museum admission, no bookings required). Josephine Powell, who recently died at the age of 86 years, was a renowned American photographer and ethnographer who spent the last thirty years of her long and extraordinary life based in Istanbul. Her mission was to document the life of Turkey's dwindling population of carpet weaving nomads and to form a collection of tribal weavings. Her aim was to leave behind a body of work that would enable future generations to know about a textile culture and way of life that was fast disappearing. In this talk Susan Scollay will show slides taken by Josephine in the late 1980s during the summer migration of the Saçıkara tribe in Anatolia. It was the last time this group of nomads used camels rather than motorised transport on their annual trek. Susan will also show images of the major exhibition of Josephine's kilim collection displayed at the Yildiz Palace in Istanbul in April 2007. The Powerhouse Museum's embroidery collection is richly diverse and representative of the majority of the world's great embroidery traditions. This talk, illustrated by examples from the collection, offers an introduction to this highly decorative aspect of our specialist textile holdings. Embroidery is typically ornamental; it is also often used to strengthen a fabric and, when decorating clothing, may convey information about the wearer's social circumstances. The Museum's embroidery collection has been growing steadily since the early 1880s; the objects chosen for this talk reflect a range of materials, techniques and cultures and include 17th century English beadwork, a child's hat from Afghanistan, an early Tasmanian sampler, a late 19th century American quilt, a Japanese wrapping cloth, a raphia dancing skirt from Zaire, a gold-encrusted Punjabi waistcoat, and an Akira Isogawa dress. You are invited to an exhibition of quilts and paintings at High Valley Wine & Cheese Co, Cassilis Rd, Mudgee. The quilts are by Guild member, Belinda Betts, and the paintings are by her mum, Robin Bell. The exhibiton runs to 10 April 2008. Congratulations to Guild members, Esther Aliu, Judith Day, Julie Haddrick and Lisa Walton for being selected as semi-finalists in the American Quilter's Society 2008 Show & Contest at Paducah. Best wishes for the prize announcements coming up in late April. Esther, Judy, Julie and Lisa were all prize winners at the 2007 Sydney Quilt Show and you can see their quilts in the gallery on the Guild website. 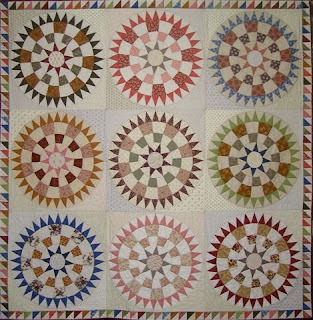 You can also view more of Esther and Lisa's quilts on their blogs (see sidebar). Please e-mail me if you are a Guild member and would like your blog added to our blog roll. The Committee is thrilled (and relieved!) to report that someone has stepped up to the important role of newsletter editor for The Template and is busily working on preparation of the June issue. The deadline for content for this issue has been extended to 8 April. If you have an article, calendar item or other contribution for the newsletter, please send your e-mail to the Template Editor. PS: Your March issue of the newsletter will be in your mail box very soon. It's less than a month until the Guild's "away" meeting at 1pm on Saturday, 5 April 2008 at the Bocce Club at Malua Bay, 12 kilometres from Batemans Bay. The [new] guest speaker will be Robyn Ahern, editor of Patchwork & Stitching magazine bringing her own brand of humour to the presentation and sharing over 20 of her own quilts together with a selection from her antique quilt collection. There will be numerous door prizes so, if you're planning to join the coach trip from Sydney, make sure you get your booking form into the office as soon as possible. If you are from the Batemans Bay area (or anywhere else for that matter), please join us for a fun afternoon. Non-Guild members welcome! Dr. Gero is the guest speaker. She will discuss her extensive quilt collection - what she looks for when adding quilts to her collection and what is the current focus for her collection. She will also discuss why some quilts have left her collection as no longer relevant to it and what she does to document and store her collection. Her talk will be illustrated with many of the quilts in her collection. Don't miss this treat! In order to better service all our members, the Guild is looking to expand the range of venues where it conducts workshops. To get the ball rolling in 2008, Yvonne Line will be conducting two Sunday workshops at the Campbelltown Arts Centre in April. In addition, commencing on 15 May, Barbara Gower will be teaching an eight week beginner's course in patchwork and quilting. Campbelltown Arts Centre is a new venue for the Guild that is sure to become a firm favourite. The Centre has excellent facilities including a cafe, two gardens in which to have a lovely lunchtime walk. The centre is located five minutes from the express way, has ample parking and is wheelchair accessible. See the Guild website for more information about the Guild's workshop program. 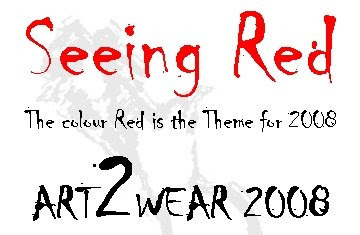 Guild members are invited to submit work for the selection of Art to Wear 2008, inspired by the colour RED. Entry forms are available from the Guild office or you can download the Art to Wear Entry Form in pdf format. The closing date for entries is 1 April 2008. The ‘Art to Wear’ is an exhibition of garments displaying superb technical skill and artistic merit, open to all members of the Quilters’ Guild of NSW Inc. This is a two tier exhibition attracting both professional and student entries.